Milwaukee Electric Tool Corporation introduces the new M18 Cordless LITHIUM-ION 6-1/2 in. Circular Saw that is designed to provide powerful lightweight cutting for a variety of applications including plumbing, electrical, framing, finishing and carpentry. The 2630 is a high performance circular saw that delivers the most durability in a cordless saw. Its powerful 3,500 RPM motor easily and quickly cuts tough material such as LVL headers. Magnesium upper and lower guards provide best-in-class durability to protect the blade from drops. The soft-grip handle is ergonomically designed to provide superior comfort and balance for easily controlled cuts. An easy-to-read aircraft aluminum shoe provides a light weight durable shoe and greater accuracy in rip cuts. 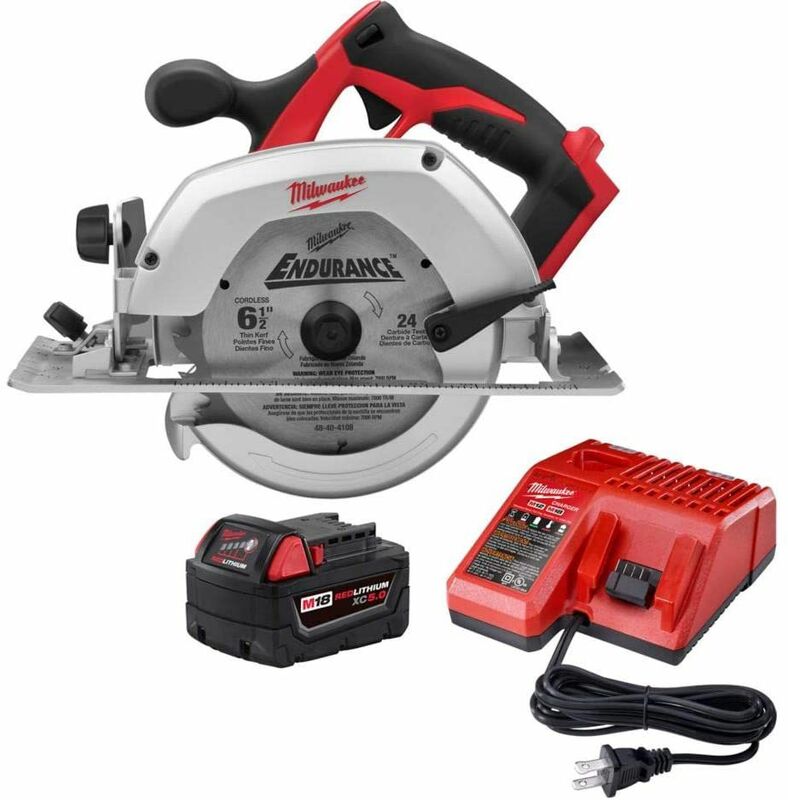 Special Buy M18 XC5.0 Kit W/ Circular Saw Milwaukee Electric Tool Corporation introduces the new M18 Cordless LITHIUM-ION 6-1/2 in. Circular Saw that is designed to provide powerful lightweight cutting for a variety of applications including plumbing, electrical, framing, finishing and carpentry. The 2630 is a high performance circular saw that delivers the most durability in a cordless saw. Its powerful 3,500 RPM motor easily and quickly cuts tough material such as LVL headers. Magnesium upper and lower guards provide best-in-class durability to protect the blade from drops. The soft-grip handle is ergonomically designed to provide superior comfort and balance for easily controlled cuts. An easy-to-read aircraft aluminum shoe provides a light weight durable shoe and greater accuracy in rip cuts. Special Buy M18 XC5.0 Kit W/ Circular Saw is rated 5.0 out of 5 by 1. Rated 5 out of 5 by Doppler from Exactly the right tool for the job And the job is trimming framing and strapping "at the job site." My experience with Milwaukee Tools has always been positive and so it was no surprise that this light-weight, portable, and powerful little saw was the perfect addition to my toolbox. Highly recommended.